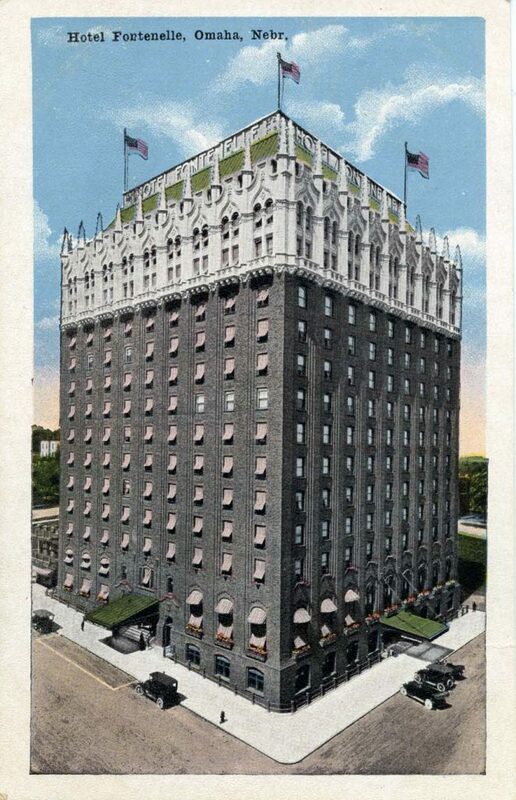 When looking at old postcards in Nebraska Memories have you noticed that some of them have writing on the front of the card or that there is a lot of white space around the picture on the postcard? This may be because in the early days people were not allowed to write a message on the back of the postcard next to the address. 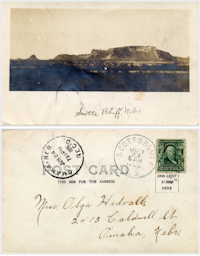 The Smithsonian Institution provides a nice history of postcards starting in 1861 when the US Congress passed an act that allowed privately printed cards to be sent in the mail. Later legislation passed in 1873 allowed the government to produce postcards with a message on one side and an address on the other side. These government postcards could be mailed for 1¢ however privately created postcards cost 2¢ to mail. In 1898 the prices were changeed so all postcards required just a 1¢ stamp. 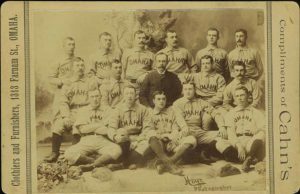 Other laws were enacted between 1898 and 1906 that changed the requirements on what information must be printed on the back of a postcard however; people were still not allowed to write a message on the back of the card next to the address. 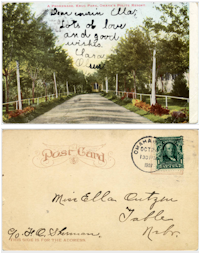 Americans were finally allowed to write on the backside of the postcards in 1907. According to the 1906 Post-Office Department Annual Reports for the Fiscal Year ended June 30, 1906, this change came about after the meeting of the Universal Postal Union that took place in Rome. After a bit of research, I learned that Universal Postal Union (UPU) is the international organization that sets the rules for international mail exchange. The UPU was established in 1874. 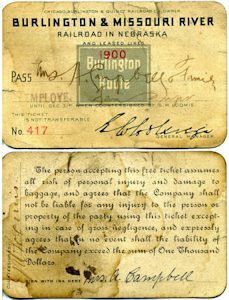 The change to allow writing on both sides of the card came about because of public request. Folks did not want to write a message on or next to the images on the front side of the cards. European countries were the first to make this change. Starting on October 31, 1906 the US Post Office started allowing postcards mailed from foreign countries to be delivered in the US with writing on the back. 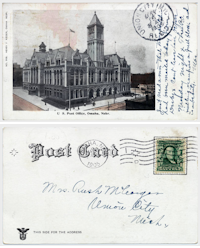 On March 1, 1907, the US Post Office allowed postcards mailed domestically to have written messages on the left side of the card next to the address. 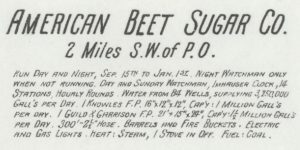 If you read the original text in the 1906 US Post Office report, you will see that they refer to the side of the postcard that contains the address to be the front of the postcard. 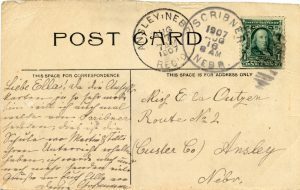 This period between 1901 and 1907, when folks were not allowed to write on the back of the postcard has become known as the Undivided Back Period. 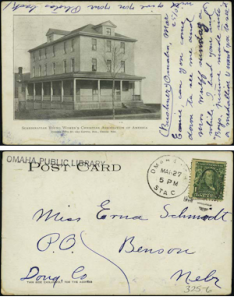 All of the postcards included in this post are from Nebraska Memories and examples from the Undivided Back Period. Looking at the back of these postcards, you will see that all of them contain a printed message that makes it clear that the only thing that can be put on the back of the postcard is the address. If you lived in a small rural town in the early 1900s, would you expect your local physician to be able to handle a case of Pott’s disease or a cleft palate? 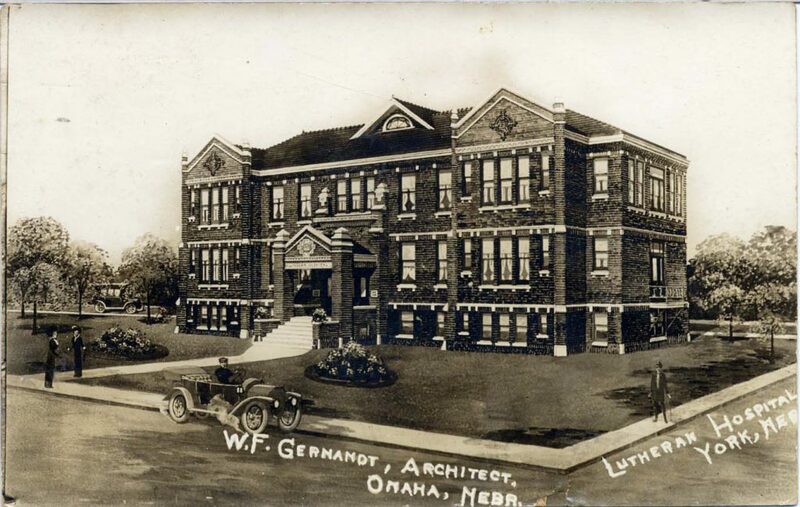 In 1905, the Nebraska Legislature believed children with deformities needed extra help and funded what was first known as the Nebraska State Hospital for Crippled, Ruptured and Deformed Children but soon became the Nebraska Orthopedic Hospital. As reported in the Biennial Report of The Nebraska Orthopedic Hospital for the period ending November 30, 1908, the hospital was established “by act of the Legislature … to provide hospital care for the crippled and deformed of this state who by such hospital treatment might be converted from wards of the municipalities or counties from which they came into individuals who in one way or another might become self-sustaining and independent.” As further biennial reports show, the patients were not all children. 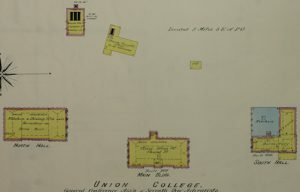 Half of the $10,000 budget for the first year was used to remodel the boys’ dormitory on the campus of the Home for the Friendless. 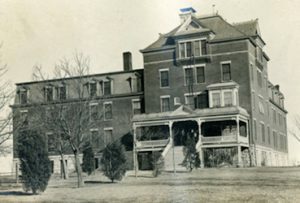 The hospital then opened for patients on October 1, 1905. The first year’s report to the governor, while describing its work with 106 patients, outlines the problems of not having a newly built hospital with all the facilities needed to treat and rehabilitate patients. 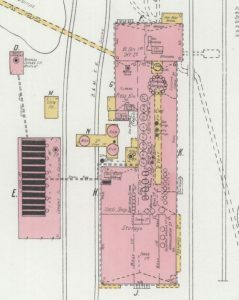 In 1908, the Lincoln City Directory lists the hospital’s address as 2129 S. 11th Street and directs visitors to take the S. 10th Street streetcar. No matter how patients arrived, they came from all parts of the state, including Sioux County in the farthest northwest corner. Over the next few years, the hospital took over additional buildings on the campus and extensions to the buildings were added, like the sleeping porches at right. Fresh air was considered important in recuperation, and without air conditioning, sleeping quarters with as many windows as possible made things more comfortable. As a number of the patients stayed for an extended period of time, various services needed to be provided such as a teacher to school classes and a gymnasium for physical training. 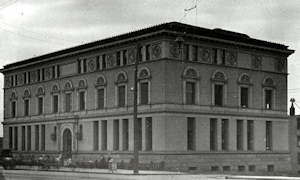 By 1915, the hospital had its new building (shown at left) at 1041 South Street, a block away from the old one. According to the biennial report of 1916, this building included “new and modern office rooms, library, reception rooms, dining rooms, school rooms, laboratory, surgical department complete, and three wards with a capacity of forty beds. … the different floors communicate by inclines instead of stairways.” But the report also includes recommendations for further updates of the other buildings. 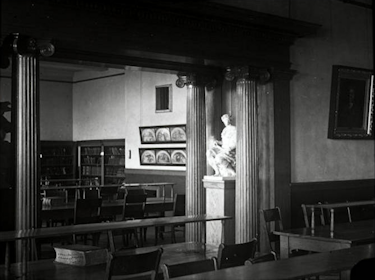 The State Library Commission was in charge of furnishing the new library at right, as well as stocking it with materials and supervising it. 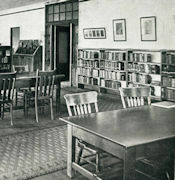 The library served both patients and employees. Students of the nursing school established at the hospital would have found many useful materials here. The school started in 1906, provided two years of training, following which some graduates went on to study for higher degrees. The students provided extra help with nursing duties and probably cut down on salaries that would have been paid to full-time staff. The children’s ward at left looks rather spartan but was probably very easy to keep clean. Patients didn’t necessarily stay in the wards all the time. In addition to fresh air, the doctor’s also promoted the benefits of sunshine and activity. Vocational training was encouraged for those who could manage it. Visitors were permitted for a few hours every day. And the entertainment was provided, especially in later years. For example, in the 1950s, Jock Mahoney, an actor, stuntman, and former stepfather of actress Sally Field, visited with patients in the hospital. The hospital continued to add buildings and make improvements over the years. In the 1920s a cottage was built for the superintendent, and a separate dormitory was built for the nurses. A dental department was added and the physiotherapy equipment expanded in the 1930s. Although the hospital admitted and treated 1,587 patients in the 1970-1971 biennium, the 1971 Legislature decided to accept the recommendation of a 1968 study which said the hospital should be closed. On August 2, 2017, the Nebraska Hall of Fame Commission selected Thomas Rogers Kimball, a Nebraska architect, as its newest inductee. The Nebraska Hall of Fame was established in 1961 to recognize prominent Nebraskans. 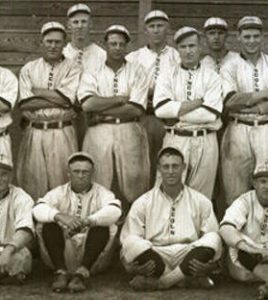 As of 1998, only one person is added to the Hall of Fame every five years. 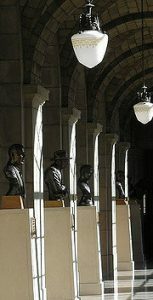 Busts of Hall of Fame members are placed in the Nebraska State Capitol. An induction ceremony for Kimball will be planned in 2019. 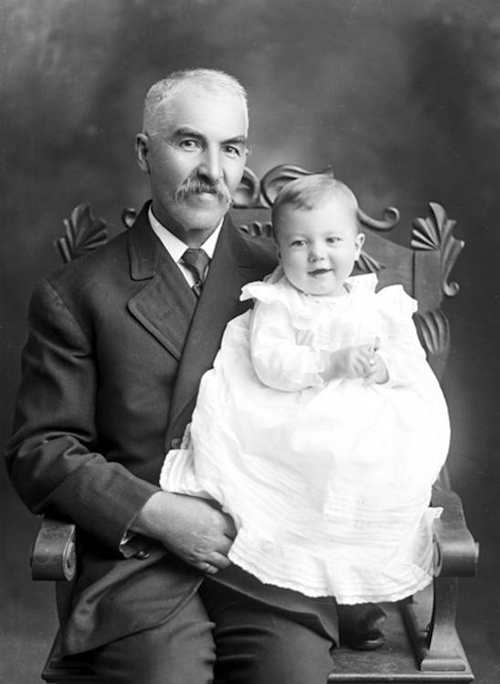 Thomas Rogers Kimball was born in Ohio in 1862 but moved to Omaha with his family when he was in his early teens. Kimball studied at the University of Nebraska then went on to study architecture at the Massachusetts Institute of Technology. 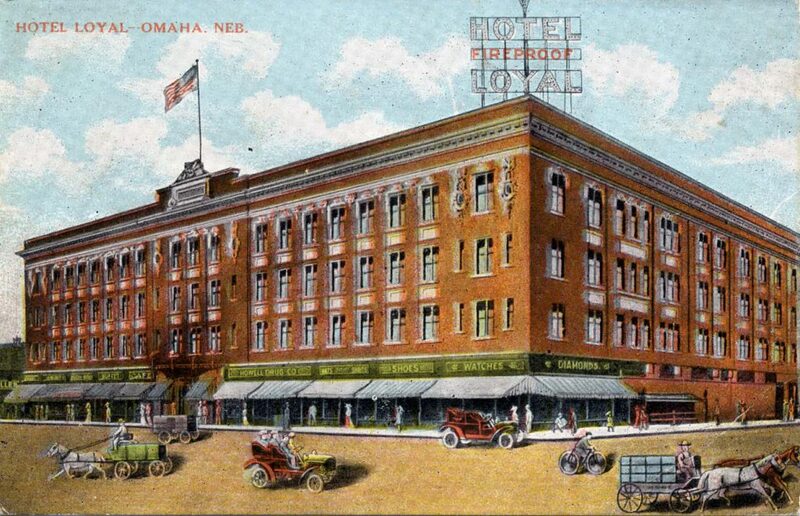 In 1891, Kimball returned to Omaha and opened an office. Kimball designed numerous buildings, many of which are still in use today. 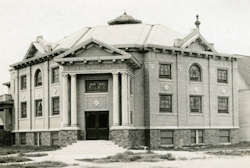 In Nebraska Memories, there are images of fourteen different buildings that Thomas Rogers Kimball designed. Here are few of the buildings you may recognize. 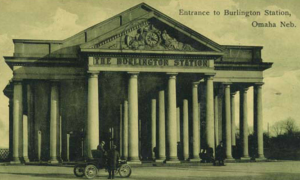 Entrance to Burlington Station, Omaha, Neb. St. Cecilia’s Cathedral, Omaha, Neb. 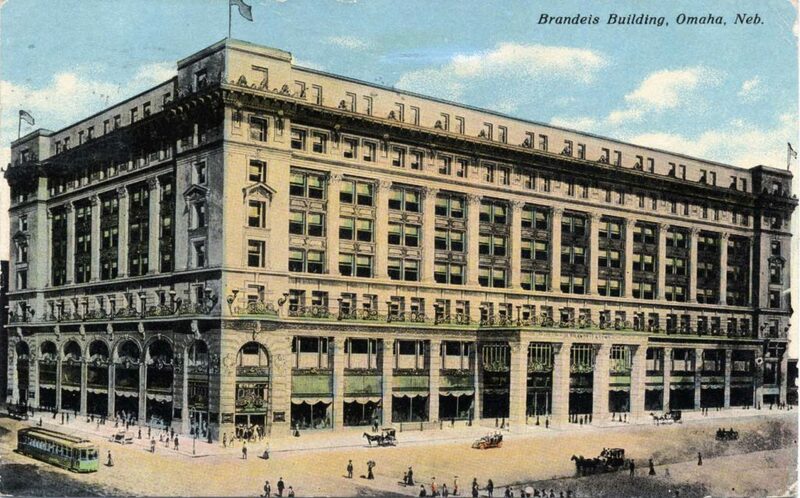 In addition to designing buildings, Kimball also served as an architectural adviser on numerous projects both in Nebraska and in other states. The two most notable projects in Nebraska included the Trans-Mississippi Exposition and the State Capitol. Rogers along with C. Howard Walker were co-architects-in-chief of the Trans-Mississippi Exposition and designed a few of the buildings. Kimball also served as an architectural advisor for Nebraska State Capitol Commission. He was involved in organizing the competition that lead to the design of the current Capitol. Thomas Rogers Kimball died in September 1934 just after the Nebraska State Capitol was completed. The Great War (later known as World War I) was the first large multi-country conflict in which United States forces fought. Although the U.S. took an non-intervention stance when the war started in 1914, Congress declared war and joined the Allies in April 1917 after Germany returned to torpedoing U.S. ships and offered Mexico financing to attack the U.S. on its southern border. While it took almost a year for the American Expeditionary Forces (AEF) to arrive in France in great numbers, AEF was established one hundred years ago this month under the command of General John J. “Black Jack” Pershing. Pershing started his military career at forts in the western territories after graduating from West Point in 1886. After fighting in several Indian campaigns, he was assigned to the University of Nebraska in Lincoln as a professor for military science and tactics and Commandant of Cadets (at left Pershing with some of his staff at the University, Townsend Studio Collection) . While there, Pershing formed a drill company which was later renamed the Pershing Rifles. Pershing attended the UNL law school and took his degree in 1893. Pershing is remembered in the naming of several buildings in Lincoln, including an elementary school and an event facility. 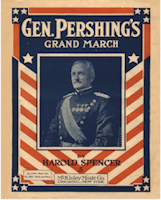 And while they may have been singing Gershwin’s “Over There” on Broadway, Fall City’s own Harold Spencer honored Pershing with “General Pershing’s Grand March” (above right, Polley Music Library Collection). Young men such as Marvin Murphy (above, Butler County Gallery) volunteered from towns across Nebraska joined the fight. Of course this photo was taken a few years before Marvin served in France and Germany at the age of twenty-two. As did many Nebraska veterans, Marvin returned to Nebraska, raised his family, worked in the family business, and served in a civic capacity. Some families saw more than one son off to war. The two youngest sons of Joseph Welty both served in the war (at left, Butler County Gallery). Herbert would also have been twenty-two and Paul twenty-six. Three of the sons already had military experience, serving with the Nebraska National Guard during the Mexican insurrection in 1916. And, as happens in small towns, relativ es through marriage also served in the military. 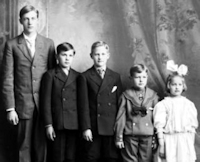 Louis Welty, the second oldest son, married Mary Rosetta Delaney (standing at far right in the photo at right) whose younger brothers Charles (seated next to their mother) and Michael (seated next to Mary) were two of the older participants in the Great War. Charles was thirty-five in 1918 and Michael thirty-eight. Not all the volunteers served in the army or overseas during the war. 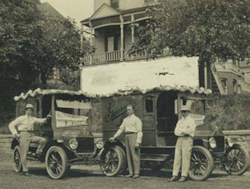 From the George Schweser family (at left, Butler County Gallery), Harold, the oldest served as a lieutenant in the Balloon Service in Oklahoma. 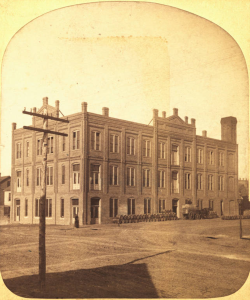 Closer to home, at Fort Omaha, was the Balloon School (at right, Omaha Public Library Collection) which taught about 800 men for the Signal Corp in the war. Carl, the second oldest Schweser, served as an airplane mechanic at Camp Taylor in Alabama. And, Robert, the third in line, served in the navy. Not all those who served made it back home from the Great War. Some died in the training camps from measles, flu, dysentary, or other diseases. 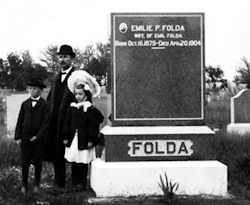 Some died when their ships were sunk on the way to Europe and many more, like Albin Folda (at right with his father and sister at his mother’s grave, Butler County Gallery) died on the battlefield. Albin’s grandparents had emigrated from Bohemia, looking for a better life in the United States. They found it on a Nebraska farm they homesteaded fifty years before their twenty-four year old grandson died in France. Your library has boxes and boxes of old photographs, documents and who knows what else. They’re old. They’re dusty. Some are labeled. Some aren’t. They’ve been in those boxes for years. You don’t know what to do with them. You’d like find a way to preserve them, preferably in digital form, but this type of project seems overwhelming. Where do you start? How do you get started? The good news! You don’t have to go at it alone. If your town is like the one I grew up in, there’s always someone or some group looking for a project. In fact, your local historical society or museum would make a fantastic partner. Chances are, they have the resources to help you identify those photographs. Also, projects are easier (and more fun) when you share the workload. But wait! There’s more good news! The Nebraska Library Commission manages Nebraska Memories, an online archive of digital Nebraska-related historical and cultural heritage materials. Funded through a combination of funding from the Institute of Museum and Library Services and the Nebraska Library Commission, Nebraska Memories contains images digitized from photographs, negatives, postcards, maps, lantern slides, books and other materials. 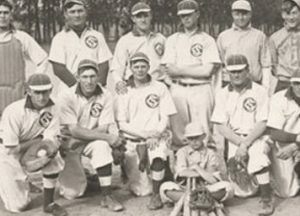 Working either independently or with a partner, Nebraska cultural institutions have digitized and contributed more than 5,000 items to Nebraska Memories. 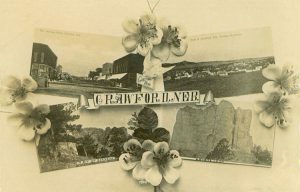 Libraries and other institutions that have partnered to digitize and upload materials to Nebraska Memories include the Antelope County Historical Society and Tilden’s Raymond A. Whitwer Memorial Library; the Crawford Historical Society and Museum and the Crawford Public Library and the High Plains Historical Society and Museum and the McCook Public Library. I hope after reading this post, you’ll find the prospect of a digital preservation project less overwhelming. Also, you might decide to reach out to a local historical society or museum in order to host a program or two on local history. If your institution is interested in participating in Nebraska Memories, see http://nlc.nebraska.gov/nebraskamemories/participation.aspx for more information, contact Devra Dragos, Technology & Access Services Director. Do your dirty clothes and linens seem to multiply overnight? Do you never get to the bottom of your laundry basket? Can you hum the old Hoagy Carmichael tune, “Washboard Blues”? Do you know the F.B. Callahan lyrics? “Keep rubbin’–keep scrubbin’–keep tubbin’–keep drubbin’ ole dirty cloes.” Just imagine not having an electric washing machine and clothes dryer to do most of the back-breaking work for you. 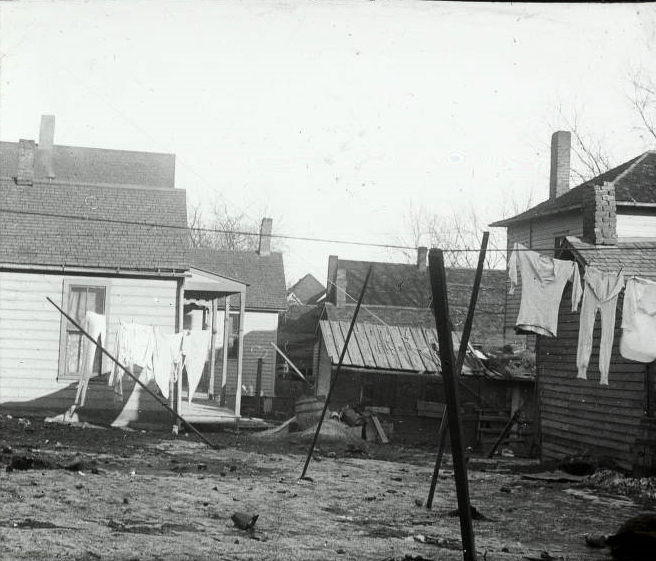 Lincoln also had its share of laundries (not including dry cleaners or dyers and cleaners). 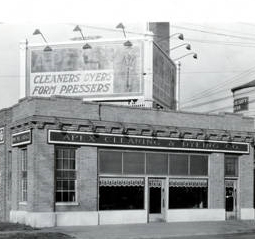 The 1908 Lincoln City Directory listed seven laundries and two “Chinese laundries.” In 1924, the number had increased to ten; 1930 also lists ten, but with a loss of one and a gain of another; the 1951 directory lists the first self-service laundries; and in 1960 the number of full-service laundries had dropped by half while the number of self-service laundries had quadrupled to twenty. 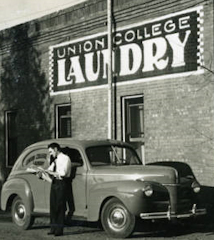 People who wanted the convenience of fully automatic washers and dryers but could not afford their own had a place to go, while those who could have afforded to send their laundry out could easily purchase the machines to do their own. Miss Jessie M. Towne, D. O. G.
Whenever I see an antique portrait of a person either in an antique store or online, I always wonder who they were. 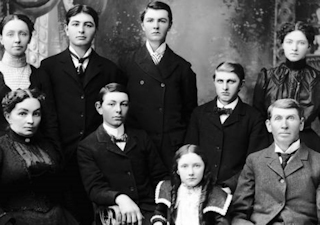 With over 900 portraits in Nebraska Memories, there are plenty of them for me to wonder about. In Nebraska Memories, the amount of information that is provided about each person depends on many factors including where the photo came from and what information was written on or attached to the photo. I thought it might be fun to pick a portrait and see if I could learn more about the person. I looked at a few different portraits and decided to research Jessie M. Towne. The portrait of Miss Jessie M. Towne is part of Omaha Public Library’s collection. The record for Miss Towne provided me with some great information to start my research. She worked at the Omaha Central High School for over 40 years retiring in 1930. She was a teacher, dean of girls and an assistant principal. I also learned that her father was Solon R. Towne. He was a health inspector and ornithologist. I started my research by searching the US Census in the MyHeritage Library Edition database. (MyHeritage is a genealogy database that is available to all Nebraska residents at no cost through NebraskAccess.) Here is some of the information I found from looking at multiple censuses. 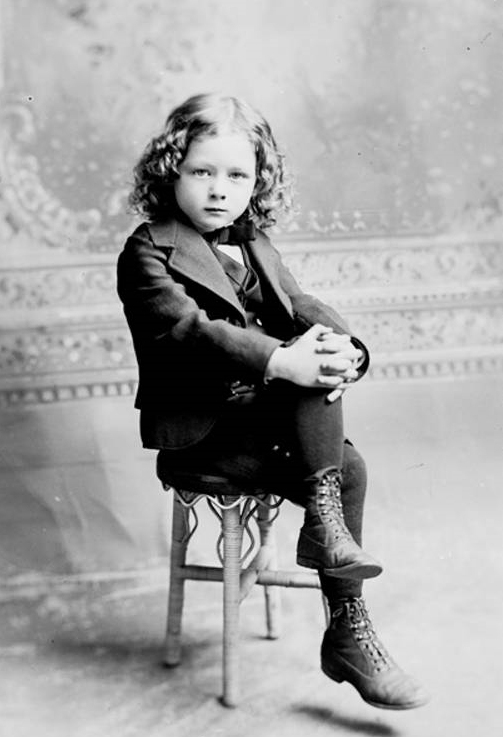 Jessie was born in July 1874 in New Hampshire. Her parents were Dr. Solon R. Towne and Harriet C. Towne. Jessie was the oldest of four children. She had one younger brother Robert S. Towne. She had two sisters Mary A. Towne and Alice C. Towne. In the 1940 Census, both Jessie and Mary were single and living together at 1502 North 54 street in Benson, NE. Next, I searched another one of my favorite sites, the Library Of Congress’s Chronicling America: Historic American Newspapers collection. 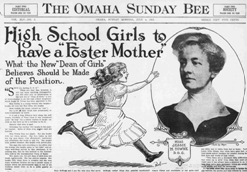 The first article I found was “High School Girls to have a “Foster Mother”.” It appeared in the July 4, 1915 issue of the Omaha Daily Bee and talked about how she was recently appointed D.O.G. D.O.G. stands for Dean of Girls. Miss Towne looks like a series women in both the portrait and the photo that was included in the article. The article, however, describes her as someone who laughs. “Miss Towne does not giggle. But she laughs with her whole person. Her face lights up and her big eyes dance with amusement, merriment and sometimes she rocks to and fro. She laughs with perfect freedom. She laughs with girlish glee.” The article was very amusing to read. I also learned that she had already been teaching at the high school since 1895. An article that appeared in the June 23, 1915, issue of the Omaha Bee talks about how she was assigned the position of Dean of Students in addition to being the head of the English Literature department. With the addition of the new responsibilities, her salary was increased from $1,400 a year to $2,000 a year. Another great source of information was the Omaha Central High School Archives that contains digitized copies of the school’s newspaper and yearbooks. Jessie was mentioned many times in both. Here are a few of my favorites. The February 1916 issue of The Register contains a picture of her as a small child. The picture and accompanying article can be found on page 14 of the PDF document or page 26 of the newspaper. “Gallant Harrie Sbearer Recuses Fair Maiden”. In the February 10, 1928, issue of The Weekly Register, there was an article describing how a ghost was stalking Miss Towne. In a second article, they tell about how Miss Towne jumped up on a seat to make an announcement and found herself unable to move. While the article implies that it might have been the ghost at work it turns out her shoe got caught in the seat. Her shoe came off when Harrie helped her down. The Central High School Foundation has a short bio of Jessie on their website. Not only did Jessie teach at the school she also graduated from there in 1892. She took courses at Harvard, Stanford and graduated from the University of Nebraska. At some point in time, she was made vice principal. When Jessie attended and taught at the High School it had a much more formal feeling than I would expect to find at a school today. The photos in Nebraska Memories provide us with a glimpse of the ornate sculptures and artwork in the corridors and classrooms. Even though I’ve already learned a lot about Jessie, I decided to do a couple of more searches. I’m happy I did because I found what I think is the most interesting piece of information. 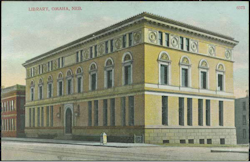 In 1913, Jessie presented at the nineteenth annual meeting of the Nebraska Library Association. The article starts at the bottom of page 394 in Public Libraries, Volume 18. The article outlines the events of the two-day meeting that was held at the Omaha Public Library. Jessie presented a paper on the reading of high school students. As I mentioned before Miss Jessie Towne retired in 1930. She passed away on July 8, 1957. She was survived by her sisters Miss Mary Towne of Omaha and Mrs. Fred Deweese of Lincoln. While I was researching Jessie, I couldn’t help but find some information about her family. Here are few interesting tidbits of information that I found. Jessie’s father Dr. Solon R. Towne sounds like an interesting man. He served as president of both the Nebraska Audubon Society and the Nebraska Tuberculosis Association. You can read more about him in the article “Notes on Dr. Solon R. Towne and Early Bird Study in Omaha and Nebraska” in the April 1964 issue of The Nebraska Bird Review. Jessie’s mom Harriet was active in the Omaha Women’s Club and helped to start the Visiting Nurses’ Association in Omaha. You can see a photo of Harriet on page 3 of the document “The Omaha Visiting Nurses Association during the 1920s and 1930s”. I learned a bit about her sister Alice in the article “Physical Education for Women at Nebraska University, 1879-1923”. Alice attended and then worked at UNL. 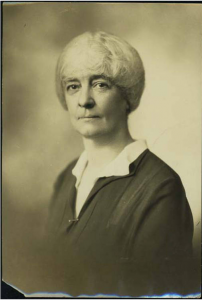 In 1908, she was appointed professor and director of the women’s gymnasium. The article contains two pictures of Alice. Spring is here and birds have been returning to Lincoln and building their nests. However, the rat-a-tat-tats I’ve been hearing aren’t all woodpeckers! It’s construction season for houses and roads. Lincoln’s 2015 population estimate was 277,348, up 7.3% from 2010; it is a seller’s market at the moment as the city continues to grow. Between 1920 and 1930 Lincoln’s population increased by 38.2%. Although the annexation of Bethany Heights (1922), University Place (1926) and College View (1929) contributed about 8,000 of the 20,985 new Lincoln residents, there was still a definite need for more housing. Sheridan Park, one new housing development, was organized by Harvey Rathbone, secretary and manager of Sheridan Park Investment Company and president of Rathbone Company (real estate). 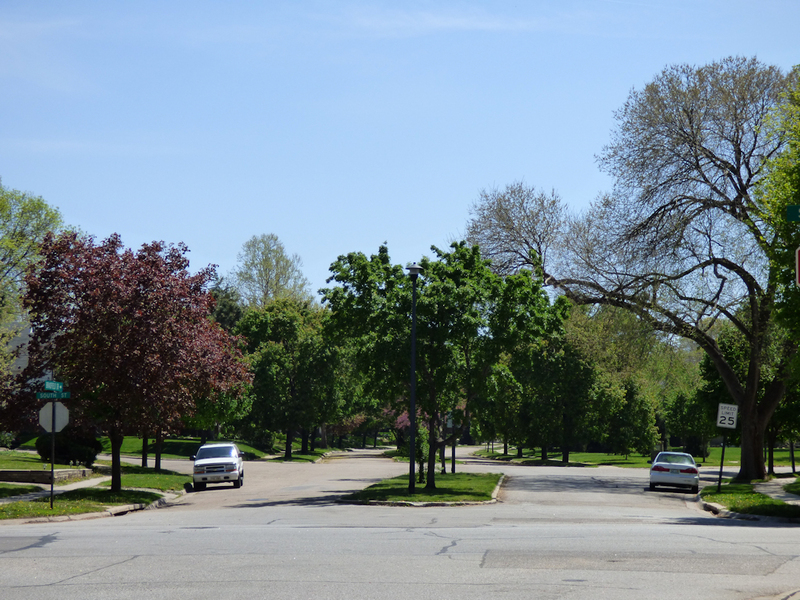 Now part of the Boulevards Historic District, Sheridan Park’s original plat map shows a rectangle bounded by South and Van Dorn Streets and 27th and 31st Streets, and includes several interior streets that curve and have medians. Sheridan Boulevard follows a geographical ridge with the streets on either side following the same line. 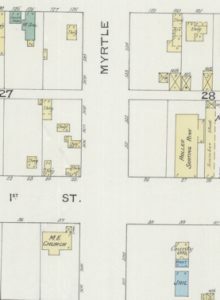 The final layout was very close to that of the plat map, but a few streets have different names, and 31st Street, which became Winthrop Road, ended up with several curves in it. 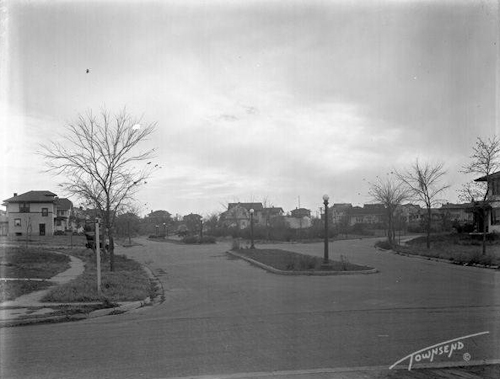 On the east side of Winthrop Road, Rathbone later created a subdivision called Rathbone Village; that name was sometimes used when referring to all of Rathbone’s development in this area. The photograph below shows Bradfield Drive, the north entrance to Sheridan Park/Rathbone Village, from South Street in 1923 (all historical photographs in this post are from the Townsend Studio Collection). The first house on Bradfield Drive was built in 1917 and the last in 1940. Along the way, streets were cut and paved as needed. New machinery helped with the process, as seen in the photograph at right. With the brand name “Best” stamped above the grill, the machine used to pull the equipment that cut and lifted the sod has a motor and continuous tracks like a tank for traction. However, the wagons used to haul away the sod were still pulled by horses. The side view of this machine shows its size and the equipment it is pulling. This second section has various rods and chains as well as three wheels shaped like a ship’s wheel that the men appear to be working. Instead of continuous treads, it has wheels–the back ones larger than the front. Abel Construction Co. is printed on the side of the second section. Abel Construction Company started as a paving contracting company in Lincoln in 1908 and is still in business today under the name Constructors, Inc. Along with brick-paved streets, the new housing division had other modern conveniences, such as electricity. Even though there is a windmill behind one of the bungalows in the photograph at the right, there are electric poles and lines running by the houses. Perhaps the reliability of the electricity was still a little iffy and the windmill was used like a backup generator. In addition to housing, people have various other needs. In the above photograph, at left in the distance behind the building with the smokestack, was the dancing pavilion at Antelope Park. The park eventually expanded to run down the length of the east side of the development and is part of the city’s current bike trail system. 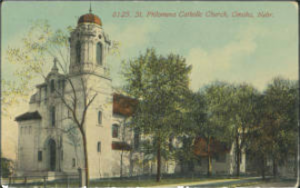 In 1925, Sheridan Elementary School was built in Sheridan Park on Plymouth Avenue, and Westminster Presbyterian Church was built a few blocks to the west on Sheridan Boulevard. When you drive through the new housing developments today and see the little stick trees planted in the front yards, just think of how they will look 90+ years from now. As in the photo below taken at the South Street entrance to Bradfield Drive, you won’t be able to see the houses for the trees! Just a Brief Note . . . .
Before I became a librarian, I worked as a researcher for a consulting firm. Most of my work focused on clients who were involved in environmentally-based litigation. While I mainly read typed or printed government records, occasionally a client asked me to look at older documents – shipping manifests, diaries and correspondence – stuff that was written in longhand! As you can imagine, I became proficient at reading nineteenth-century handwriting. Recently, I had a chance to put those skills to the test when a postcard written in German crossed my desk. For the record, I cannot read or speak German. Before I asked a retired professor from Nebraska Wesleyan to translate, I attempted to do so using Google Translate. I realized pretty quickly the handwriting was not the nineteenth-century script I had dealt with previously. For starters, it may incorporate both German and English cursive. The script appears to an older form of German-language handwriting known as Kurrent. Kurrent is based on late medieval cursive and German cursive. It was used heavily in Middle to High German-speaking regions during the nineteenth and early-twentieth centuries. Like any written script, Kurrent characters vary in shape and form, making it difficult to interpret. This particular letter was written to a young woman, named Ella, by her grandmother. In the letter, Ella’s “Granny” mentions two people known to Ella, who had taught at Scribner High School. Although brief, Granny shares some family history, as well as let Ella know that she’s not far from her thoughts. This letter also tells us that Ella reads, and most likely speaks German. Based on the fact that Kurrent was used in specific places, we have an idea of where Granny lived before moving to Nebraska. Additionally, Scribner wasn’t settled until the 1870s, when the railroad arrived. 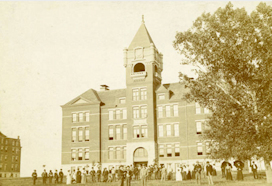 The high school featured in this image, wasn’t built until 1885. Granny most likely was a relatively recent arrival in eastern Nebraska. Brief notes like this one can share a lot of information. They drop hints about the writer’s and the reader’s backgrounds and relationships. Postcards offer us a glimpse into the private worlds of people like Granny and Ella. Nebraska Memories is a cooperative project to digitize Nebraska-related historical and cultural heritage materials and make them available to researchers of all ages via the Internet. Nebraska Memories is brought to you by the Nebraska Library Commission. If your institution is interested in participating in Nebraska Memories, see http://nlc.nebraska.gov/nebraskamemories/participation.aspx.For more information, contact Devra Dragos, Technology & Access Services Director. Every time I see this image of the Burlington Shops in Nebraska Memories, I wonder what the gray things are piled up in front of the buildings. Before asking for help identifying the items I had to do my own research. I’ve learned a lot about the Burlington Shops. I still don’t know what those items are but I have some better guesses now. Before I share my guesses and ask for your help, let me tell you what I’ve learned about the Burlington Shops in Havelock. The book Lincoln: The Capital City and Lancaster County, Nebraska, Volume 1 (1916) provides a nice history of the town and the shops. 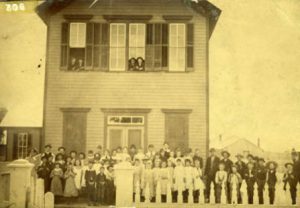 The town of Havelock was incorporated on May 6, 1893. It was located about four miles northeast of downtown Lincoln. 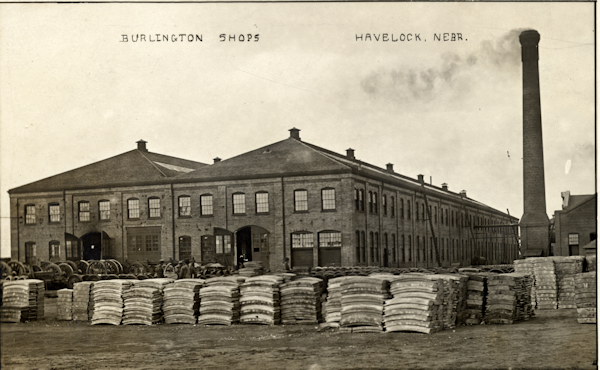 Around the same time, Burlington decided to locate a repair and manufacturing shop in Havelock. Work on the first building started in June of 1890. A blacksmith shop, boiler shop and a new shop building were added a few years later. The next large expansion came 1910. I was surprised by the amount of information I was able to find about the shops and expansion that took place around 1910. I found two journals articles published in 1911 that included detailed information about the Burlington Shops. At first glance, the articles may appear to be identical but they are slightly different. They contain too much information for me to include in this post but below are links to the articles along with few highlights. Here are a few highlights from these articles. Both articles provide detailed drawings of the property that includes the location and dimensions of every building. I found it fun to compare the map to a current bird’s eye view of the shops. Many of the builds are still being used today. The newly built storehouse is 80 ft. wide, 500 ft. long, and three stories high. It is surrounded on three sides by a 16 ft. wide platform. While both of these journal articles provided me with a ton of information, I still didn’t have any good guess about the objects in the photo. I thought they might be made out of cement because if you look at the bottom of a few of the stacks you can see that a few of them have broken. 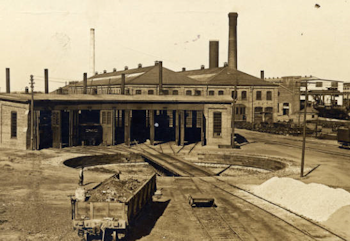 The article A Modern Concrete Slab and Pile Plant appeared in the 1921 issue of Railway Track and Structures, Volume 17 confirms that there was a concrete plant at the Havelock shops. The article listed some of the items manufactured at the Havelock Shops. “In addition to the concrete slabs and piles, the concrete plant is equipped to manufacture concrete fence posts, platform curbs, hog troughs and some miscellaneous items.” Included with the article was a picture of concrete curb units but they do not match the items in the picture. Now that you know a bit more about the Burlington Shops at Havelock, what do you think the items are piled in front of the boiler shop? If you haven’t already done so, take a minute and go view the image on the Nebraska Memories website. You can use the zoom function to get a better view. What do you think they are? As you can see, there are a few different items. I can pick out three different styles for sure. At the far left, you can see three small piles. I think they are flat but they do have slight curve to them. In the middle of the picture are items that have a slight arch to them. 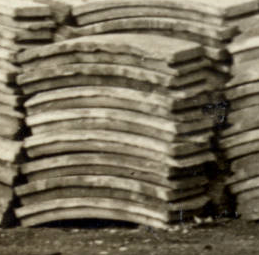 If you look at the bottom of the piles, you can see a significant gap between the middle of the items and the ground. As I mentioned before a few of them have broken. Do you think these and the first items are both curbs used on curves? The items at the far right are much shorter. I think they have a slight arch to them. 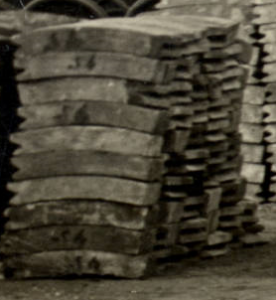 As I was looking at the picture of the roundhouse, I was wondering if these pieces could be used to line the turntable. Do you agree with my guesses or am I completely off track? Are these pieces used in assembling a train engine? Leave me a comment and let me know what you think they are. If you are interested in the Burlington shops, I found two additional historical journals articles that I read but didn’t reference in this post. I thought you might enjoy reading them. 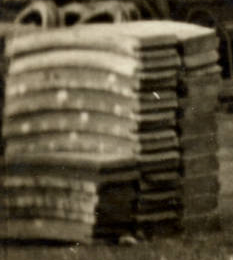 The Concrete Fence Post Factory of the C. B. 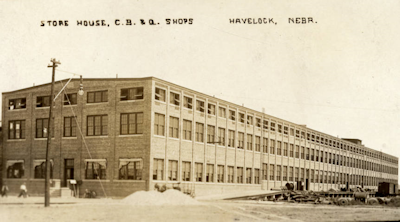 & Q. R. R. Co., Havelock Neb. 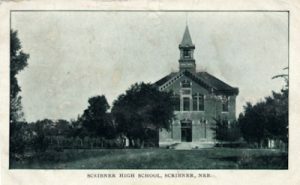 Postcard of Scribner High School, Scribner, Nebraska. Approximate date early 1900’s. At 32,599 square miles, the island that contains the Republic of Ireland and Northern Ireland has just over two-fifths the area of the state of Nebraska. However, it has made a huge impact on the world through the immigration of its people to other places. While the largest diaspora occurred during the potato famines of the 1840s, many Irish continued to move to the United States throughout the rest of the nineteenth century and the early twentieth century. A fair number of them came to Nebraska. 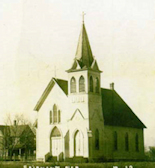 According to Nebraska Moments by Donald R. Hickey, et al., the very first church built in Nebraska Territory was a Catholic church to serve the Irish population in 1856. 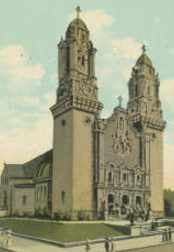 Another church purported to have been built for residents of Irish descent some 26 years later was the St. James Catholic Church of Fairmont at left (Fairmont Public Library Collection). 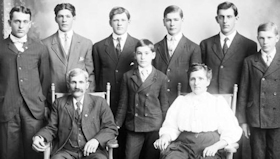 After Germans (a mix of Catholic and Protestant faiths) and Swedes (generally Lutheran), the Irish made up the third largest ethnic group of immigrants to Nebraska. 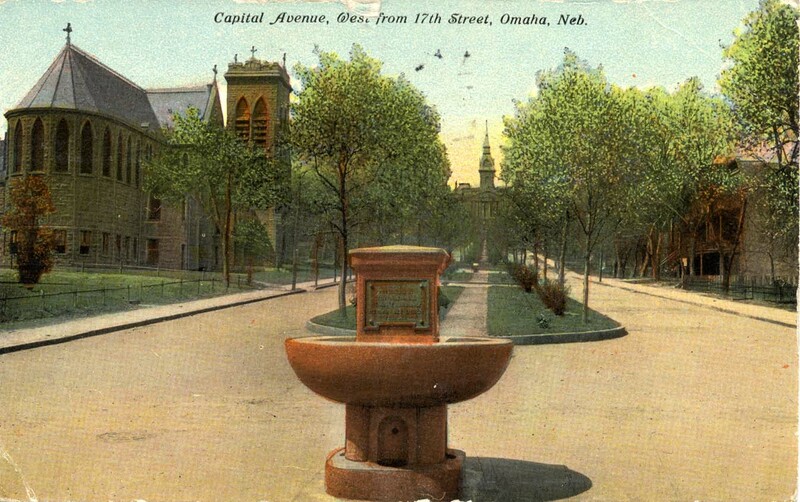 O’Neill, which has been proclaimed “The Irish Capital of Nebraska,” was named for John O’Neill, who helped establish several towns in Nebraska with Irish settlers. O’Neill, a U.S. Civil War veteran, had worked for “Home Rule” in Ireland, trying to push the British out. 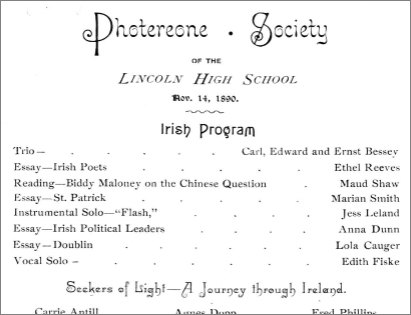 Some years later in 1890 that topic was raised in a program at Lincoln High School by the Photereone Society (Polley Music Library Collection). Along with a mixture of music and dramatics, students debated Irish Home Rule and discussed the issue of Chinese immigration. In two years the Chinese Exclusion Act that suspended Chinese laborer immigration to the United States was due to expire; the Act was renewed in 1892. Some people also wanted to restrict the immigration of other ethnic groups, including the Irish. The Irish worked at a variety of jobs in Nebraska. William McGaffin, above with his son Wesley (Butler County Gallery), and his first wife Margery emigrated to the United States in the late 1860s. 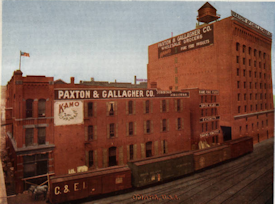 After spending some years in New York, the McGaffins moved to Butler County, Nebraska in 1885. McGaffin published the Bellwood Gazette that year and ran the paper into the 1920s. Joseph Haney, at right (The Lincoln Police Department Collection), was a baby when his family emigrated in 1881. From age 16-20, Haney drove a police wagon for the Lincoln police department. Another Irishman, Captain William T. B. Ireland who was born in New York, served with the Lincoln Police Department for over 20 years. 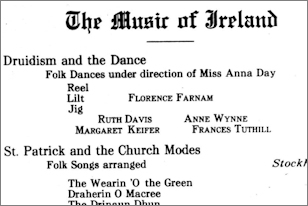 Whether or not you have descended from those earlier Irish immigrants, you might have enjoyed the St. Patrick’s Day musicale at the Temple Theatre in 1913 with song and dance (Polley Music Library Collection). I plan to enjoy some Irish dancing myself tonight across the street in the newer performing arts center. Enjoy your St. Patrick’s Day! 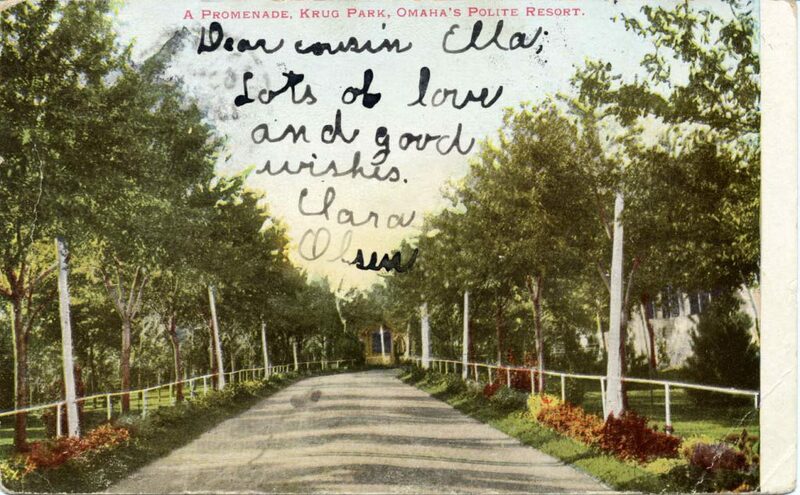 Postcard of Promenade Krog Park, Omaha’s Polite Resort, Omaha, Nebraska. Approximate date early 1900’s.